Checking back through my old posts I notice that I positively raved about John Simpson's Not Quite World's End. I can't remember the book too well now, but it must have left quite an impression because I chose The Wars Against Saddam on the strength of the author's name alone. This time around I'm not so unconditionally enchanted, but I'm not disappointed either. One look at the title, combined with the knowledge that Simpson is a BBC journalist, gives you quite a good idea what sort of book this might be. If I were to label it more precisely, I would say: war reporting, combined with elements of travelogue and political commentary. A decent combination, at least for my tastes. Scores of authors worldwide really should thank Saddam Hussein for providing such a rich source of material. Not only did he wage three massive wars (Iran-Iraq, First and Second Gulf War), but he was also kind enough to play the villain with a flair worthy of Anthony Hopkins. Whatever else you can say about the guy, you have to admit that he caught the world's attention and held it (even if the Western propagandists did their best to help). 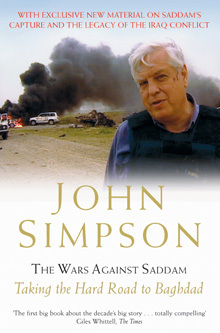 I bet a huge number of journalists have made a lifelong career out of reporting Saddam's misbehaviour and John Simpson is one of them. Reading The Wars Against Saddam so soon after Robert Fisk's massive The Great War of Civilisation was a bit of an anticlimax. On its own, Simpson's book is really tasty: witty, balanced, evocative. Compared to Fisk's fiery diatribe, it comes across as somewhat mild. It might be a lifetime training in 'objective' journalism, but Simpson avoids too strong opinions and hardly ever points a finger. He definitely couldn't be accused of taking sides, and maybe this really is what journalism is all about, but it felt slightly toothless. It might be a question of perspective - blame Fisk - but if I received a lasting injury from trigger-happy American troops, I wouldn't be so goddamn polite about this! (Possibly I'm being bloodthirsty and irrational here while John Simpson is behaving like a mature, balanced gentleman. Could be...). I have a feeling - mind you, it's only a feeling - that he chose to conceal a lot of what he witnessed, for elegance's sake. Or, perhaps, for politics' sake. Would the BBC kick him out were he more drastic, I wonder? Anyway, The Wars Against Saddam is a decent read. Simpson knows how to write and a lifetime spent on the front line cannot but force you to become an expert in international power struggles. An eyewitness's view adds colour to his reporting. He's been there, he's seen it, now he gives the world his professionally polished version of what happened.